When I first began trading I did it part-time, meaning I worked, went to school, and traded “on the side.” It was nice. Eventually though, I transitioned to trading full-time. All that really means is trading was my main profession. Over the years, I’ve got my hands dirty in other areas, side projects, web design, executive boards, volunteering, etc. but continue to trade and blog. Making the transition to trading full-time was a bit scary at first and I made some mistakes in the process. Since then, I’ve learned from those mistakes and improved my trading even more. We all like to multi-task, but in trading, multi-tasking is no good. It’s fine to look at multiple charts and scan multiple markets. What I mean by don’t multi-task is focus all your energy on the trade. Don’t have the TV on in the background, don’t make plans for what you’re going to do with the money you may make, don’t surf the net, just trade. A troublesome situation for me was to be in a trade and already looking to the next trade instead of focusing on managing the trade I already have on. The thing that helped me break free of my multi-tasking bad habit was to simplify my trading screen, have a set routine, and time block. By time blocking I just mean blocking out chunks of time each day for certain tasks. I will typically spend the morning with the markets, then mid-day work on a blog post or other various projects, and go for a bike ride in the afternoon. By time blocking I break up my day into projects (i.e trading, blog, workout, family time, market homework, etc.) These blocks of time can be as little as 30-mins and in fact, blocking in 30-mins is actually proven to be the most effective way to get things done. It’s called the Pomodoro technique, developed by Francesco Cirillo in the late 80s. This technique breaks down work into intervals of 25-mins, with a 5-min break. Think about it, how many times do you get up from you computer and walk downstairs to refill your coffee, or check the mail, or just go for a quick walk. I’m constantly getting up. With the Pomodoro technique it allows me to say, okay I’ve got 25-mins to knock this out, then I can take a break. It works well for me, I’d recommend giving it a try! This was totally counter intuitive to me. When I began trading full time I set these deadline of when I wanted my account to reach 100k and how in X months I wanted to be making 10k per month. Every time I would fall short of a deadline I’d get discouraged. Instead of saying yeah I was consistently profitable this month and didn’t take any major losses, I would look at it and say, dang I didn’t make it to my 10k goal I’m a failure. First of all, no you’re not. The only way to truly fail is to give up. So I switched my targets to read as achievements. My goal by the end of the year is to be consistently profitable month after month. Then I broke down what I needed to do to achieve that goal. The time required looking at the markets each evening to be prepared for the following day. Every time I went to place a trade I’d ask myself, is this a valid setup or am I just itching to place a trade. The other achievement I set was a weekly average goal in that, in order to sustain your lifestyle, how much do you need to bring in each week (then add 30% to that for commissions and taxes, plus it’s good to have a buffer). Setting that kind of a goal rather than a hard deadline helped motivate me. This one I’m sure I talked about before, but I can’t stress enough how important it is to only compare yourself to yourself, not to others. Don’t make excuses. Stop and think about what advantage you have that others don’t. Sometimes referred to an “unfair advantage.” Focus on how you can improve you and don’t worry about what other people think. Those were the 3 things that really helped me focus in and make it as a trader on my own. If you can go into it with a positive attitude and surround yourself with good people the opportunities will make themselves available to you. As traders we like to do things our way, so don’t be afraid to call the shots and be different. That doesn’t mean tell your boss to take a hike you’re quitting, but there’s no reason you can’t live a life where you enjoy doing what your doing. I urge you to take control of your own financial future. Put together a long term picture of what you want your like to be like down the road, sit down with your spouse and family and put together a plan. Start small in the trading game, but don’t be afraid to take chances. Typical “jobs” will always be there. There’s no better time than right now! Do you think it is possible to trade futures while still working a full time job. 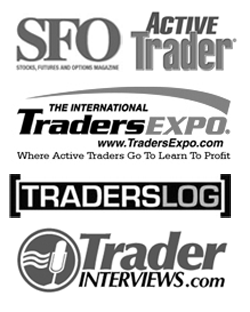 Trading from a smartphone or tablet… or is that financial suicide? Also, do you ever swing-trade positions using futures contracts. I following the market and futures but I don’t have the time to trade a lot because of my job. The only thing I do from a phone or tablet is manage swing trade positions. I would not encourage day trading unless you can devote a chunk of time (such as a few hours each morning) solely to that. As for swing trading futures contracts. I’ve used the weekly S&P options on futures in the past, but typically stick to day trades with the futures markets. The risk is just too hard to cap. 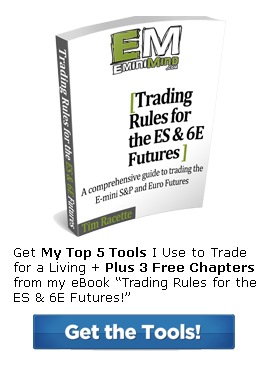 I am also a full time e-mini futures trader and I echo your sentiment about setting deadlines. Last January I set myself a target of $x, and I was about $600 short of that amount on 30 Jan and I committed a cardinal sin by not pre-defining my risk before taking a position, needless to say not only did I not hit my target, I gave back most of my gains for the month is pursuant of that target. 1. Do / did you find yourself occasionally trading impulsively and not following your plan and if yes – how do / did you overcome the urge to trade impulsively. 2.Employing time blocks of 30 mins for trading – doesn’t this encourage you to ‘force trades’ that might have not fully developed or a level that has not been hit during that 30 minute block? Or is it a loosely set time slot. Say for instance the current trend or swing leg is up and it starts correcting downwards, and you see a high probability long trade at 50% retrace level which is also a prior pivot and also some significant symmetry level, however you 30 min time slot is up and the market is 6 ticks away from your ideal entry. Would you take a break and forfeit the trade or simply extend the 30 minute slot to see the trade through, or would you enter a stop buy and take a break? 1. The times I traded impulsively were when I was bored (usually in the afternoon), or when I had just taken a losing position in a fast moving market. The way I overcame this was to decrease my # of contracts and focus on only the trade at hand, doing everything in my power to capitalize on the opportunity, trading off the information that is in front of me. Reducing my # of contracts helped because when I do have losses I’m not emotionally attached to the loss. I also envision what it feels like to take a full stop out before every trade. If I can accept this loss mentally up front, then I’m much more objective in the trade instead of being scared that the trade will show me a loser. 2. The 30-min time blocking is just a guide. I block out the first 2 hours of the trading day to FOCUS entirely on trading. That’s really the goal. Pick a time slot and focus, don’t multi-task. The more things I have lining up at an entry the more conviction I have to take it. At the end of the day, you gotta hustle – meaning make it happen. No excuses period. That’s the only way to make it as a trader.